This is the story of two teams -- Concord De La Salle, a private Catholic school in an upscale Northern California suburb, and Long Beach Poly, a proud public institution from a blue-collar SoCal seaport -- striving to achieve the same goal: the all-American dream. 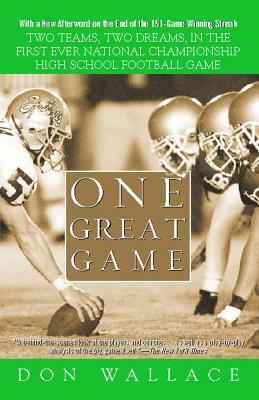 In this supercharged account of the first-ever national high-school championship game, acclaimed sports journalist -- and former Poly varsity football player -- Don Wallace goes out onto the field and straight into the heart of each team. One Great Game offers a rare look at the world of young-adult sportsmanship, featuring up-close and personal interviews with the team players and their families, coaches and cheerleaders, rabid fans and sworn enemies. The result is a powerful piece of sports literature in the tradition of the classic Friday Night Lights. More than a book about football, One Great Game is an engaging cultural history about twenty-first-century American life. "[E]njoyable....Wallace gives an evenhanded account while conveying the excitement the game created." "Wallace deserves credit for a historic record of a game that won't soon be forgotten." "A behind-the-scenes look at the players and coaches...as well as a play-by-play analysis of the big game itself."